Welcome to the website of GibX, Gibraltars Premier Park and Ride Transfer Service, Transporting Gibraltar employees from their residential communities in Spain directly through to the commercial areas of Gibraltar. GibX was founded by an ex-employee of Gibraltar living in Spain who knew only too well the difficulties and inconvieniences of commuting to and from Gibraltar. A need was identified to make commuting to work more relaxing and enjoyable and so after being made redundant the founder set to work developing the GibX service. GibX hope to ease the daily grind of commuting, reduce road traffic congestion, reduce air pollution while improving the travel links between Gibraltar and Spanish costal towns further afield such as Manilva and Estepona. Why choose Park and Ride ? Why stress about getting to work and back and dread the commute ? Why not enjoy your commute in a relaxing environment, read a book, catch up on emails, or listen to music ? Why struggle to get parked at the border, pay for parking then worry about vehicle security ? Why not leave your car at home, or with your other half to use whilst your at work, why have two cars ? Why queue at passport control ? Why not stay seated as you are professionally escourted through by imigration control ? Why endure the weathers walking to and from work across the runway, arriving at work or home either damp from rain or perspiration? Why not travel in comform sheltered from the weather in a climate controled vehicle ? Why arrive at work or home stressed, weathered and in a poor attitude ? Why not arrive relaxed, fresh and feeling good ? The all new Park and Ride transfer service is targeted at the Gibraltar working community living in Spain, our transfers offer a much needed direct service to ease the daily grind of commuting to and from the commercial areas of Gibraltar. At the border our friendly staff professionaly liase with Gibraltar imigration control, all aspects of Passport Control is taken care of. 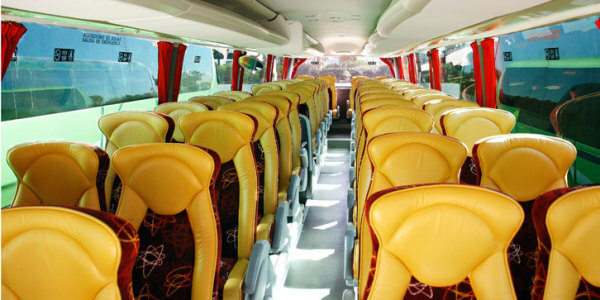 All our buses have air-conditioning and heating, providing you comfort travel in a Smoke Free environment. Our service also provides a community for people to meet and make new friendships, a place to catch up on work assigments, emails, read a good book, or listen to audio. All our buses will soon be installed with wi-fi access and flat screen TVs. Our service will be continually developed to suit the customers requirements, your feedback is very welcomed and greatly appreciated.